One more day left in the work week- Woo Hoo! Feet a little tired from sporting stilettos? Give your toes a break from their woes, and throw on a pair of low heels. This can be a tough shoe group to pull off, but that's what "Almost There Thursday" is all about. This week, try some playful peep toed pumps, like "Compliments of the Chef" from Seychelles (available on Zappos.com). 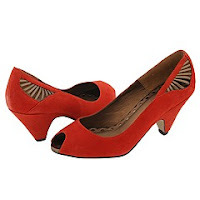 The 2.5 inch heel on this orange suede pump will keep you comfy, and the peek-a-boo straps on the side add a little zest. Lower heels mean higher voltage drinks. 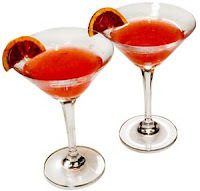 Run or skip to the bar (because your feet are so happy), and ask for a blood orange cosmopolitan. Make sure you ask the bartender to mix a little extra Ketel One Vodka with the Triple Sec, lime juice and blood orange juice. If they don't have blood orange juice, regular should suffice... it just won't match your shoes as well.